Dashboards can be a powerful way to communicate insights. All too often dashboard potential is not fully realized as a result of little thought being put into the final design or chosen data visualizations. 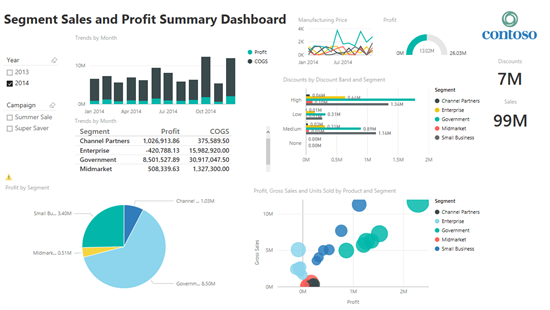 By merely refining your dashboard design, you can truly enjoy the full power that lies within Power BI. Effective dashboard design is both an art and a science. Don’t get caught up in the pizazz, razzle and dazzle of any data visualization just because it is slick, colorful, or you just happen to like the way that it looks. In reality, your creative delivery of information may be confusing, distracting, miscommunicating, or unintentionally undermining dashboard value. Anyone that presents data should strive to make it easy for their target audience to comprehend. A few simple design changes can make a huge difference in context and clarity. Take a look for yourself in this before and after example of not so good and good design. This “Not So Good” example suffers from a lot of common design mistakes. First of all it has too much information for the audience to quickly understand. The inconsistent Segment colors within charts will likely be confusing. The column chart x-axis quarter labels do not align to the shown monthly values. Single total numbers do not have any context with regards to trends. The pie chart fails to communicate the negative Enterprise results. The Manufacturing Price line chart is way too small and has no legend. The Discount Bands bar chart is also quite small with unnecessary labels. Lastly the table with the scroll bar in the middle of the screen does not add any value. The scroll bar reduces dashboard usability. See if you can spot even more issues with this dashboard design. In the Good example, we have reduced information overload, noise and confusion by selecting a few appropriate data visualization types and adding context. This time all information nicely fits within the screen without scrolling. The Segment colors are now consistent within the bar and scatter charts to improve clarity. Single total numbers have improved titles to describe reporting time period and are accompanied by sparklines to show trend context. The bar chart clearly shows the negative Enterprise results now. The scatter chart adds perspective at a glance with regards to the Product performance within a Segment. We have also added a date under the dashboard title to help the audience understand when this information was last updated. Even though there is still room for improvement, this example showcases how different design decisions enable you to be far more effective in communicating insights using dashboards. If you don’t have time to study visual perception principles, review presentations or take a class to further enhance your dashboard authoring expertise, here are a couple design tips to keep in mind. Ask how a dashboard will be used and design for next step actions. What information does the reader need to be successful? How much detail does the reader need? What action can be taken and how? How are exceptions or insights that need action highlighted? What learned or cultural assumptions may affect design choices? What do colors mean and can they be visually interpreted? Don’t forget to use color blind friendly palettes or icons. Good design should tell a story with data that does not become overwhelming with way too much information, clutter or noise. Limit content to fit entirely on one screen. Be cognizant of audience natural textual reading tendency. Starting with the highest level of detail in the upper corner of the screen and show more detail you move down in the direction the audience is used to reading. 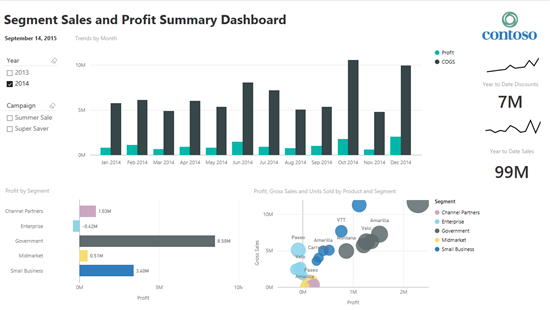 Keep your dashboard simple with only a 3 to 5 key values, charts, or tables. Avoid putting too much information on a dashboard. Remember to provide adequate context and keep related items near each other. Avoid displaying “singular numbers” without any other context. Show degrees of change for quick comparisons. Avoid data visualization variety for the sake of variety. Choose appropriate data visualizations. Don’t use charts that distort reality i.e. 3-D charts. Keep in mind that it is difficult for the human brain to interpret circular shapes. Pie charts, donut charts, gauges and other circular chart types may look pretty but they are not a data visualization best practice. Be consistent with chart scales on axes, chart dimension ordering and also the colors used for dimension values within charts. Be sure to encode quantitative data nicely. Don’t exceed three or four numerals when displaying numbers. Display measures to one or two numerals left of the decimal point and scale for thousands or millions i.e. 3.4 million not 3,400,000. Don’t mix levels of precision and time. Make sure that time frames are well understood. Don’t have one chart that has last month next to filtered charts from a specific month of the year. Don’t mix big and small measures on the same scale, such as on a line or bar chart. For example one measure can be in the millions and the other measure in the thousands. With such a large scale, it would be difficult to see the differences of the measure that is in the thousands. Don’t clutter your charts with data labels that are not needed. The values in bar charts are usually well understood without displaying the actual number. More recently the topic of storytelling with data has been extremely popular. This is a related art of finding stories within your data and communicating them in a concise, engaging way for maximum impact in a noise-filled world. Keep an eye out for future blogs on this fun topic.